Common Sense Transit Planning At last! Want a workable public transport system? One must plan on this scale as being done in the City of Surrey. Let us just add a Vancouver to Chilliwack TramTrain, instead of LRT to Langley and one would now have 270km of rail transit in the Fraser Valley. This is called “Vision”; this called planning for the future. Too bad the City of Vancouver; TransLink; Metro Vancouver and the province lack this sort of vision. I guess one can win more votes with “rubber on asphalt” and SkyTrain to everywhere, election promises than with sensible and affordable “light-rail” election promises. Light rail transit lines running the streets, everywhere. That is the vision of Surrey’s city planners. It will be presented to City Council for consideration early next week. And they are certainly dreaming big. It is part of the municipal government’s planned submission to influence TransLink when the public transit authority updates its Regional Transportation Strategy (RTS) beyond the current 10-year plan – after the Surrey Newton-Guildford and Fraser Highway light rail transit (LRT) lines are completed. This update to the RTS is expected to occur next year. According to a City staff report, the municipal government wants between 140 km and 150 km of rapid transit, which includes the existing segment of the Expo Line terminating at King George Station. The rest of this rapid transit length, serving every district and neighbourhood of Surrey, is imagined as LRT, with a preference for building as much of the network as a street-level system. Stops are spaced an average of 800 metres apart to maximize the population’s accessibility to the transit service, and the lines running along the streets would create a grid network. “Grid networks provide service to a high number of people and have the ability to attract many new riders because they are simple, direct, easy to understand and useful to a broad range of people making a wide variety of trips,” continues the report. The report includes maps of the proposed LRT lines under both the “Medium-Range” and “Long-Range” timelines of implementation. 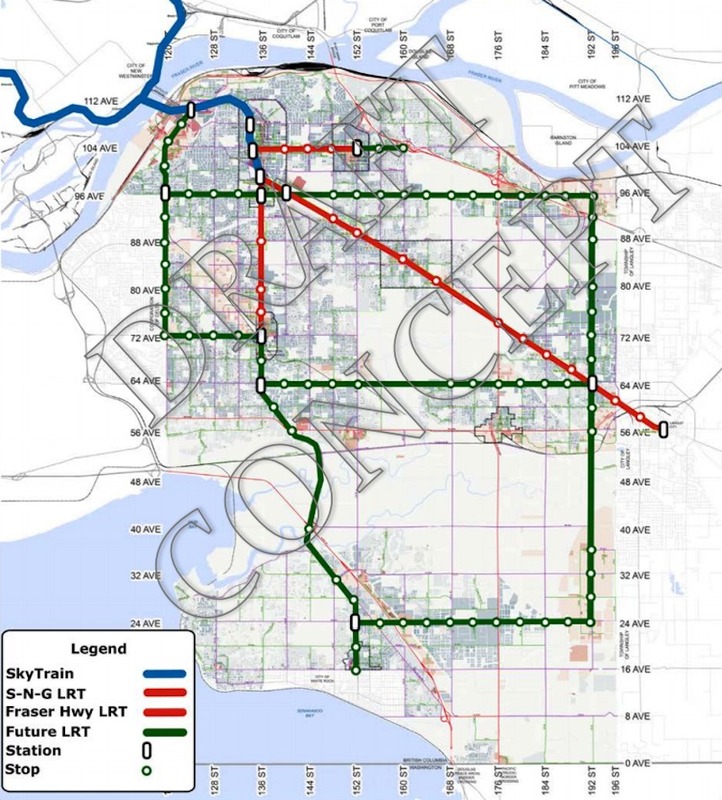 By the end of the “Long Range” timeline, the City wants to see an extension of the Surrey Newton-Guildford LRT beyond the current planned terminuses at Newton Exchange and Guildford Exchange to White Rock and 160 Street, respectively. It also envisions new LRT lines running along 24 Avenue, 64 Avenue, 72 Avenue, 88 Avenue, 96 Avenue, 120 Street, 152 Street, and 192 Street. 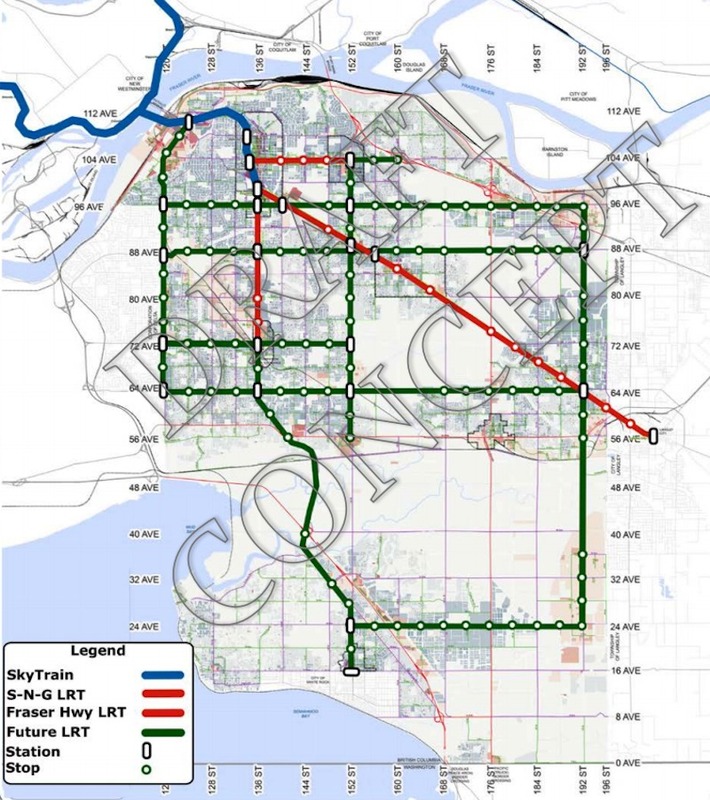 No SkyTrain extensions are currently desired by the City of Surrey. This is a potential LRT concept for Surrey when the city has a population of one million people and 500,000 jobs. Surrey has 520,000 residents today, and its population is expected to rise to 840,000 by 2046. Rapid bus services such as the B-Line are expected to continue to be precursors to rail rapid transit. TransLink plans to start a new Fraser Highway B-Line service from Surrey Centre to Langley Centre by 2019. This will be followed by a Scott Road/72 Avenue B-Line by 2021, and possibly a B-Line route from Newton Exchange to South Surrey and along 200 Street in Langley later in the 2020s. Surrey’s first LRT line, the Surrey Newton-Guildford LRT, is expected to cost $1.65 billion for 10.5 kms of track and 11 stations. Construction is anticipated to begin in 2020 for an opening in 2024, with ridership levels estimated at 42,000 to 46,000 per day over the first year of operations. It will be operated privately initially. Municipal governments across the region are expected to submit their own ‘wish list’ to TransLink ahead of the creation of the updated RTS. PPP…Ugh. Higher costs, no transparency. If they start with the LRT from Guildford to Newton which is already approved for funding, this line could be extended to Langley via cloverdale on the old rail line. Part of this line is being used by heritage trains. Then it could follow the old rail lines further east. They don’t need to build a line down fraser highway through a park. I’m getting tired of the constant stupid debates I see going on other sites. 1 The Confederation Line is a LRT. It has some Light Metro features but that is mainly because it’s running on rights of way that were originally part of our physically segregated BRT System known locally as the Transitway Network. Very little of this network is actually grade separated. Phase 3 & 4 of our LRT expansion will have “on street” sections and lines on Carling Avenue, Montreal Road and possibly Baseline and Heron Roads as well as St. Laurent Boulevard. Those “on street” sections will most likely become Transitways first and then will be converted later. However, we still have an immense amount of existing Transitways that can and should be converted to LRT. Not all Transitways will be converted to LRT, there are some existing rights of way that are more efficient and cheaper to keep for BRT. These remaining non converted Transitways will feed into the LRT Network. 2 On-Street LRT is not inherently dangerous in any way. Accidents occur on these Rights of Ways mostly because of car drivers and very poor driving habits! Otherwise they wouldn’t get built anywhere, especially in Western Europe! European’s actually own almost as many cars per capita as we do. They just use them more efficiently because they have to! European’s generally complain about traffic too, they just don’t want to flatten their towns and cities the way we do. They generally prefer to build cities for people not cars and trucks like us. Cities are also cheaper to build and cheaper to maintain that way. families are car free during the week but rent or car share on the weekend. 4. Minor point, historically, the TTC did run coupled sets of PCC Streetcars on the Bloor-Danforth and Bathurst lines in the 50′s to early 70′s. The Bloor-Danforth line ended service in 1966 with the opening of the first section of the Bloor-Danforth Subway Line. The Bloor-Danforth streetcar did move up to 12700 passengers per hour per direction at peak. On the Bloor-Danforthline at the time, there was a coupled set of cars every 75 seconds (Always a streetcar car in site was the old moto). They could do this because they had purchased over 350 PCC cars, in some cases virtually brand new from many American transit agencies (Kansas City, Newark Philadelphia and others) that, were in a mad rush to rid themselves of their respective streetcar fleets. At one point including second-hand units, the TTC had over 735 operational PCC Streetcars, not including the surviving units of the Peter-Whitt design, most of which were out of regular service and used only during peak periods by 1963-64. 5. Bus Rapid Transit or BRT has a wide variety of definitions, capabilities and capacities, mainly due to its overuse by politicians in North America. The result of this fact so far is that in many places Vancouver included, this has come to mean any improvement beyond basic bus service operating in mixed traffic is called BRT. I don’t know how often I have to scream this but I am going slowly nuts just thinking about it. The reality is that, BRT IS NEVER LIKE LRT WITH BUSES! Please, BRT SUPPORTERS, stop using this tag line! ITS JUST NOT TRUE! I could go on for pages about this one, and in the past, I have! BRT supporters, you are really doing yourselves a massive disservice saying this over and over. The reality of true BRT operations show its an independent operating technology with its own strength and weaknesses compared to rail. It may look superficially similar but I can assure you, in its planning and design it is very different than rail based systems. You can forgive politicians for saying this, its an easy tag line for the public but if your transit professionals continue to use this line, run away as fast as you can! Real BRT requires a physically segregated right of way, that means regular car and truck traffic can’t enter a side of the road or roadway median BRT right of way, outside of intersections and physically planned bus entrance and exist points. BRT rights of way can also be segregated by running beside a surface roadway in a private right of way. Access at intersections can vary with each design of private surface rights of way. Ottawa uses this approach on its Transitway network beside Woodroffe Avenue, south of Hunt Club Road intersection. At this point, the painted on street bus only lanes on Woodroffe give way to a private BRT right of way, that runs parallel to the road right of way on the west side through the National Capital Greenbelt up to Fallowfield Station. BRT rights of way can also be grade separated, above and below. Most groups that represent BRT operating technology worldwide also state that, no more than 25% of a BRT network should be painted on-street bus only lanes. These painted lanes reduce capacity of any surface BRT right of way because of driveways that touch the right of way, cars and trucks making unplanned or outright illegal lane changes into it, legal or illegal left and or right hand turns into or out of the painted lane, commercial loading zones, on-street parking lanes, improper or haphazard placement of which can cause absolute chaos with nearby painted bus lanes and of course, intersections. Police enforcement especially during peak periods becomes a must and no police agency I no of, would admit to having anything close to the number of extra police officers needed for this. The capacity of a painted bus only lane is better compared to mixed traffic operations but even in Ottawa depending on the limiting factors already mentioned above, the capacity can go as low as 3000 passengers/hour/direction (P/H/D) and never higher than 4500 P/H/D. Sorry guys painted bus lanes just don’t cut it for really good BRT service over a distance greater than a few km! Capital costs and building time of real BRT is comparable to that of LRT, its not that much cheaper if you are building real BRT. What continually dumbfounds me is that normally intelligent people when trying to save a buck or two by building something cheaper than conventional LRT, continually say flimsy little BRT systems can move the equivalent number of passengers as LRT systems. They might if you massively and I mean massively increase your prospective BRT system’s operating frequency to fantastic proportions but in most cases the relative infrastructure capacity of BRT systems lag far below that of even moderately built LRT systems. Heavier LRT’s like Ottawa’s Confederation Line would require larger more massive BRT build outs like Mississauga or Ottawa’s Transitway facilities. 6. When it comes to rapid transit generally, you not only get what you pay for, what you build and how you operate it determines your eventual success. However, there comes a time when no matter how you build rapid transit, no matter how efficiently you operate it, conditions dictate the form must change. Skytrain in my opinion has reached this point. The cost of building it has exceeded the system’s utility. Translink’s Automated Light Metro System known as the Skytrain Network exceeds most Canadian surface Light Rail Lines building costs by a factor of 200% to 300% and yet as designed, will theoretically only carry the same or up to 40% fewer passengers. Currently, when you look at even the practical passenger carrying capacity of the Skytrain which is around 14100 p/h/d (passengers per hour per direction) according to the CUTA Rapid Transit Handbook, most new LRT systems in Canada can as designed, already handle this level or could easily do it with a fairly inexpensive upgrades. The main operating cost savings of the Skytrain, it’s driverless capability, has been installed on a few LRT systems and could be installed on many more for a much lower cost. The fact that, many planned and built LRT systems only want a partial driverless capability points out the real cost savings of driverless systems. Bombardier awkwardly points out that, a similarly passenger carrying capable LRT and Skytrain fleet is not similar when you look at the size of maintenance staffs and maintenance package costs. Modern LRT is usually around 2\3 the cost, with a workforce about 45% the size required for a similar Skytrain fleet. Turn around time is also faster with LRT. You won’t find this information in public because it is considered proprietary, and if I used my real name, I would instantly be sued by Bombardier! There is currently a fight for survival between the part of Bombardier that sells LRT and the group that sells the Innovia Automated ART Light Metro Transportation System (Skytrain). LRT is winning and slowly crushing the Skytrain system. Even with Vancouver and Kuala Lumpur updating large parts of their respective Skytrain fleets, the total vehicle order just can’t compete with the 3000 delivered Flexity LRV’S and the almost 1000 more on order worldwide. That even includes the loss of over 100 units from Ontario’s many new LRT systems. All lost to Alstom’s Citadis Spirit LRV and it’s new Brampton Ontario, assembly plant! With Alstom being the vehicle provider of choice to Montreal’s REM System (a Light Metro System marketed as an LRT System), which was supposed to be a Skytrain type fleet originally, may be one of the final nails in Skytrain’s coffin. After Vancouver and Kuala Lumpur there are no more orders for Bombardier, I fear a negative decision about the future of the Skytrain technology is coming within 5-10 years. It just can’t keep limping along like this in today’s rail vehicle builder market. Bombardier needs orders in the low thousands of vehicles to not only have a semi permanent production line but needs at the least, orders in the high hundreds or low thousands to stay in the main rail vehicle product portfolio of Bombardier. After that it disappears into special niche market of transportation. Airport or amusement park People Mover Systems, Automated Monorail Systems, Urban Cable Car and Incline Railway Systems. I loved my first Nokia and Blackberry phones, they were great but just couldn’t keep up to newer cell phone designs. Now these are very small players in the cell phone market or they just offer special products for other company’s smart phones.